Let store visitors book tickets for different events in a couple of clicks. Easily send reminder emails, track purchased tickets and registered attendees in the admin panel. Looking for an easy-to-use tool to sell tickets for conferences, exhibitions, trainings and other events? With the Magento event tickets extension you'll be able to create numerous custom event pages and offer different ticket types tailored to the format of the meeting. The feature-rich module will help you track ticket sales and visitor registrations as well as to send email reminders to customers before the event. NOTE: The extension enables you to create events as simple, downloadable and virtual products. Specify custom price for each ticket type. This price will be automatically added to the base price once a customer adds the corresponding ticket type to cart. Define how many tickets of each type will be available. After the start of sales you'll be able to track the quantity of booked tickets and regulate the prices according to customer demand if necessary. Fully use all features of Magento ticket booking system. You can notify customers about upcoming events by sending email reminders. According to your needs you can either set a particular date or specify the number of days before the event to send the email. 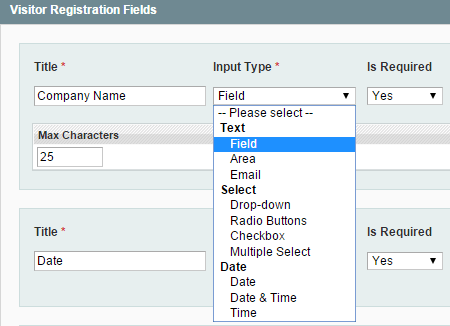 Choose which of the fields will be required and specify their sort order. Thus, due to flexible extension settings, the ticket tool will help you easily gather and manage information about event visitors. 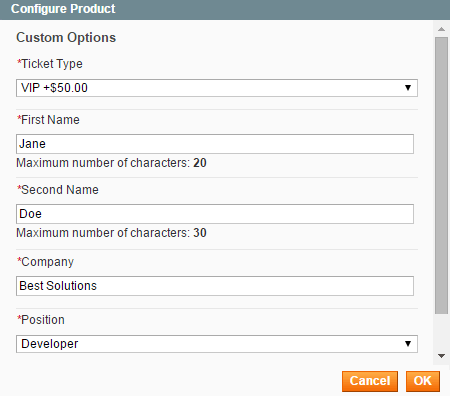 With the Magento ticket extension you can easily register event visitors from the admin panel. When adding the 'event' product to order you'll see the popup where you can specify all necessary customer data. The fields in the popup will be identical to those on the frontend registration page. Due to accurate Magento ticketing system grid you can receive real-time information about all invoiced event tickets. Use quick links to order pages to get more details about each particular order. 'Registered Attendees'grid contains visitors data specified by customers on the event registration page. With the ticket system Magento module you can easily export this information into XML or CSV files for further processing. Just bought it. The settings are clear, so I managed to set up the tool just using screenshots. The tool has been running for 3 days already - 20 tickets bought. Everything works as described. But the features selection is rather limited. I'd highly appreciated if you added the printed PDFs and QR codes to the emails.